In the luxury travel world, if you are going to Serengeti in Tanzania, there is really only one lodge that will meet all your demanding requirements: Singita Sasakwa Lodge. 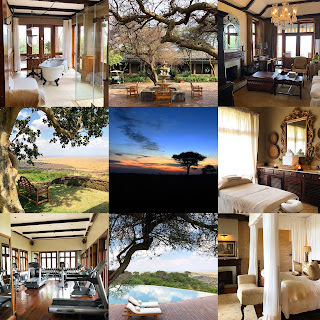 The photos on their website do not do justice to the ground of this gorgeous safari lodge. From the arrival service to food to guide, everything was topnotch. This is definitely the best safari lodging experience for me in Africa. The ground of this lodge is absolutely stunning. It looks like they moved an English manor from UK and plot it down in Tanzania. If you want to experience the romanticized version of Out of Africa, the grounds here will give you just that. The interior decor is done in a colonial Victorian hunting lodge style. From beautiful wallpaper to African statues, the designer was on point with everything down to the high tank pull chain Victorian style toilet in public bathrooms. Not to mention each of these 1/2 bathrooms are as big as most studios in New York City! The lodge is located up on a hill so you get a sweeping view of Serengeti in the public area. It's really quite lovely. I believe there are around 12 villas total. Each villa is free standing with complete privacy as there are tall trees and bushes separating each one. There is also enough distance between each villa that you are not going to hear your neighbors if you decide to eat out in your backyard! Each villa is essentially a house with its own dipping pool complete with front and back yard. There is a proper foyer with 1/2 bath as you enter the house into its living room. Next to living room is the master bedroom. Behind the master bedroom is a large closet area with a vanity desk. Next to that you have a large bathroom with a separate toilet room and a glass wall shower that makes you feel like you are taking an outdoor shower! Of course if taking a bubble bath is more of your thing, there is a claw footed bathtub as well. The whole house is impeccably decorated with wallpaper and colonial hunting lodge era style decor. Everything is well maintained and beautifully presented. In addition to the gorgeous house, view in the backyard is similar to the one at the main lodge: a sweeping view of Serengeti plain. Service, like each villa, is impeccable. Each villa is assigned a butler. I believe the butler is shared between two villas? I'm not quite sure. But in either case, my butler is always there when I needed him. He is so sweet and so on top of everything. I can't thank him enough for the service he provided me. Same with our safari guide: impeccable service and knowledge. In fact, our guide was one of the guides who served Obama family when they came two weeks prior to my arrival. He was so knowledgeable about everything. I learned a lot from him. And the fact that he can conjure up everything I wanted to see was a huge plus. You want to see a cheetah? No problem. 20 minutes later, a cheetah in front of our jeep. You want to see a pride of lion eating? No problem. 30 minutes later we came across a pride of 15 lions chowing down a wildebeest. How about a leopard sleeping on a tree? No problem. 40 minutes later, we saw a leopard on a tree taking a nap and then slowly tread down a tree to give me an excellent photo opportunities! The only complaint I have, and it's not against the lodge, is that Serengeti is on a much lower altitude compare to Masai Mara in Kenya and closer to equator than Kruger in South Africa. So what this means is that even if you are visiting Serengeti in the winter time (July/August), you will have bugs/flies. I didn't feel like I was swarmed in them but it is important to bring a hat with mosquito net attached so you don't have to constantly swapping away flies or bugs. It just makes viewing experience much easier. The spa at Sasakwa was quite nice. Again, the decor is geared more towards Victorian era which is a bit unusual but nonetheless lovely. There are two shops on site and both are quite lovely. One is more about jewelry and the other more about clothes and interior decor. There is also a tennis court facility I didn't use but there were guests playing each time I passed by. Food was quite good. Again, not Michelin star level good. But chef was thoroughly competent and I enjoyed everything I was served with. Plating was the best I had in all the safari lodges I went to if that's important to you. Food was included in the price so you can eat as much as you want anytime you want. It is possible to over indulge oneself. They have their own vegetable garden on site and I had salad often and was never sick from eating raw vegetable. All in all, I was very happy at this safari lodge. Everything was done to the highest standard. I cannot imagine there is a better safari lodge out there. Singita is a well oiled machine and this is commonly known as the best Singita lodge out there. I can see why. There is nothing I can complaint about this lodge except the price. But then again, it is at this price for a good reason: it just doesn't get better than this.